Crush walnuts and fry lightly in a pan, until toasted. Mix with matzah meal. (I’d leave this out in the future). Slice potatoes 1/4 inch thick. Divide all vegetables between 2 large 4-sided sheet pans and toss each pan of vegetables with 3 tablespoons oil, 1/2 teaspoon salt, and 1/2 teaspoon pepper. 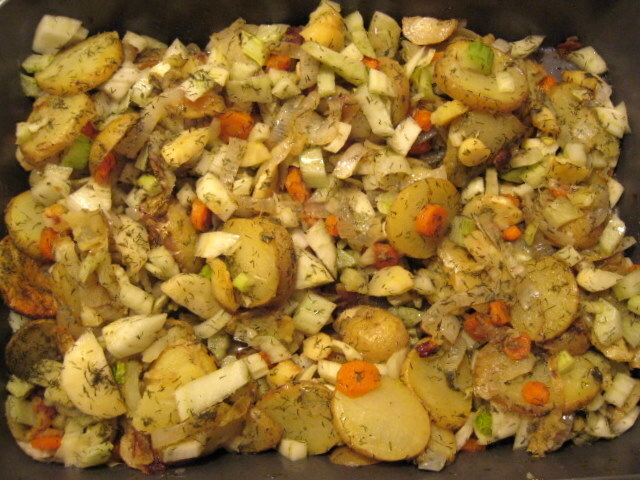 Roast vegetables, stirring and switching position of pans halfway through, until softened and golden brown in spots, 35 to 40 minutes. Leave oven on with 1 rack in middle. Add 1/3 cup water to each pan of vegetables and stir and scrape up brown bits from bottom. Chop 1/4 cup fennel fronds. Combine all vegetables in 1 pan and toss with fennel fronds and dill. Brush baking dish with some of remaining olive oil. Cover stack of phyllo sheets with plastic wrap and a damp kitchen towel. Keeping remaining phyllo covered and working quickly, place 1 sheet on a work surface, then gently brush with some oil and sprinkle with 2 rounded tablespoon walnut mixture. Place another phyllo sheet on top and repeat brushing and sprinkling. Top with a third sheet and brush with oil. Drape phyllo stack into one half of baking dish, gently pressing it into bottom and up side and leaving an overhang. Make another stack with 3 more phyllo sheets, more oil, and remaining walnut mixture. Drape into other half of dish (phyllo will overlap in center of dish). Spoon vegetables into phyllo shell. Fold overhang toward center over filling (it will not cover vegetables) and brush edge with oil. 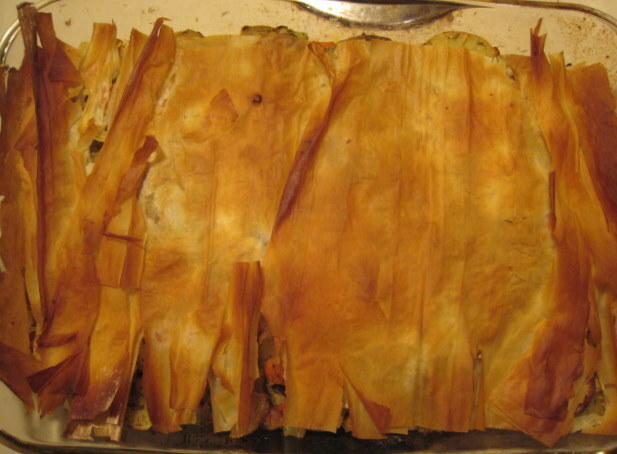 Brush remaining 2 sheets of phyllo with remaining oil, tear in half, crumple, and arrange on top of filling. Bake in middle of oven until phyllo is deep golden brown, 15- 20 minutes. Cool 5 minutes before serving. This was HUGE. When we couldn’t finish it after a few days, we pulled out the vegetables and made a soup by adding beans, tahini, canned tomatoes and more dill.